Tile flooring is an excellent flooring choice for your kitchen. It is extremely durable and can easily take the abuse dished out from kids and pets. Tile flooring can withstand moisture really well (when it’s sealed properly) and the look of the tile gives your kitchen a very luxurious ambience. Tile flooring comes in huge variety of styles, colors, patterns, and compositions, so there will always be many different choices available. Tile Buying Tip: When you or your contractor purchase your tile be sure to purchase it all from the same dye lot. The colors can vary slightly from dye lot to dye lot and can sometimes be very noticeable in your finished tile floor. Tiles are obviously very durable and can withstand the foot traffic that your kitchen experiences on a daily basis. From pets scratching along the floor, to kids wearing their shoes in the house, to dropping utensils and other items on the floor, the tile will not get damaged. The same cannot be said for laminate flooring in the kitchen (a common kitchen flooring choice) which can easily be chipped. Aside from the durability of new tile flooring in your kitchen is its ability to withstand water and moisture better than other flooring types. It’s not uncommon for a large liquid spill or household disaster such as a minor flood to ruin a laminate floor, if it’s not cleaned up quick enough. We’ve all heard a story or two about someone leaving for vacation and they have a water pipe burst, or a self-installed water filtration system (under the sink) started leaking and ruined their floors and sometimes worse. With a properly installed tile floor you won’t have this problem. Lonestar Home Solutions is a full service home improvement contractor with an extensive background in kitchen flooring, especially tile. 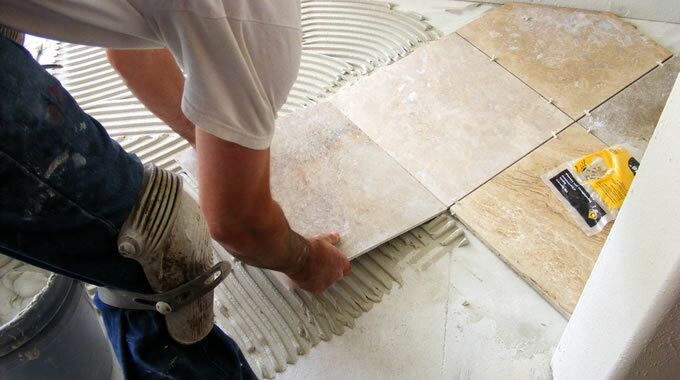 We specialize in installing tile flooring into kitchens for both home remodeling projects and new home construction. There are so many different types of tile available for your kitchen flooring project that we couldn’t possibly list them all here. If you are thinking about having a tile floor installed into your Seguin kitchen, then you probably want to hire somebody who will do a good quality job, for a fair price. Lonestar Home Solutions specializes in tile installations, it’s one of our signature services and something we are very proud to showcase. We know that if you hire us to complete your new kitchen tile flooring project that you’ll be ecstatic with the results.